Site-specific solo exhibition commissioned by the Museum of Contemporary Craft in Portland, OR in 2008. 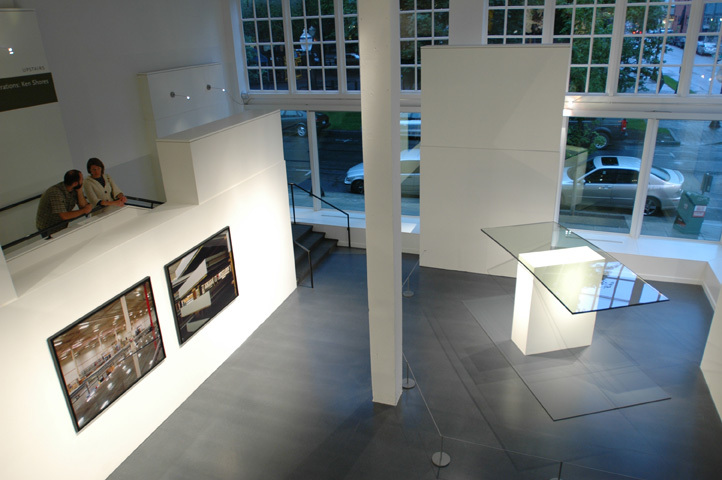 For Glass, I took a 5′ x 11′ pane of engineered skyscraper glass, originally produced for the New York Times building (which was completed in Midtown Manhattan in 2007), balanced it on a 5′ 9″ high wall and let it bend under its own weight, at risk of shattering, for the three month duration of the exhibition. 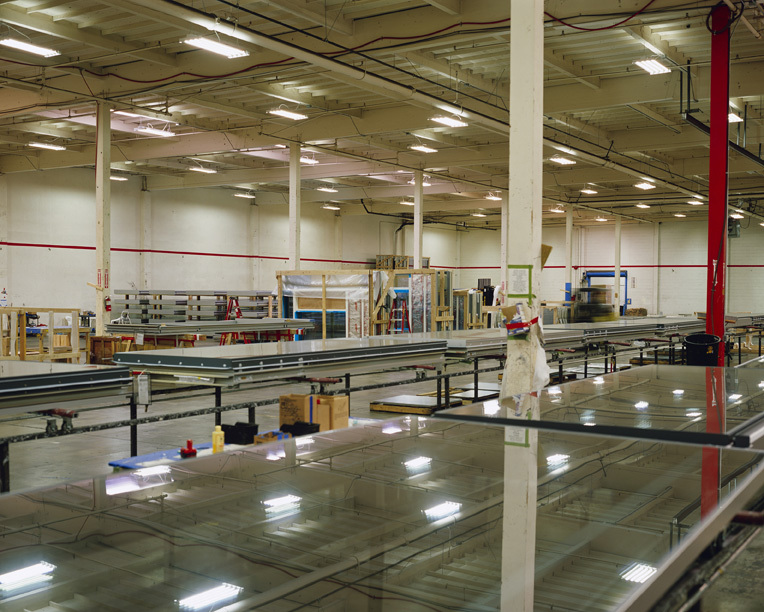 The balancing glass was accompanied by two 5′ x 6′ large-format photographs of the glass pieces in states of storage and assembly at the industrial facilities. Hung side by side, the photographs create a stereoscopic perceptual illusion. Provoked by an interest in the intersection between contemporary art, craft, and trade, I initiated a collaboration with the Portland-based industrial glass firm Benson Industries. Benson is an international producer of engineered skyscraper glass, and a developer of the technique of skinning a building with glass, a technique frequently used in modern monumental architecture. I was given access to Benson’s engineers and facilities, and was afforded the opportunity to experiment with the properties and possibilities of the glass. Glass is an amorphous solid; it can exist in many different states, and is technically neither liquid nor solid. 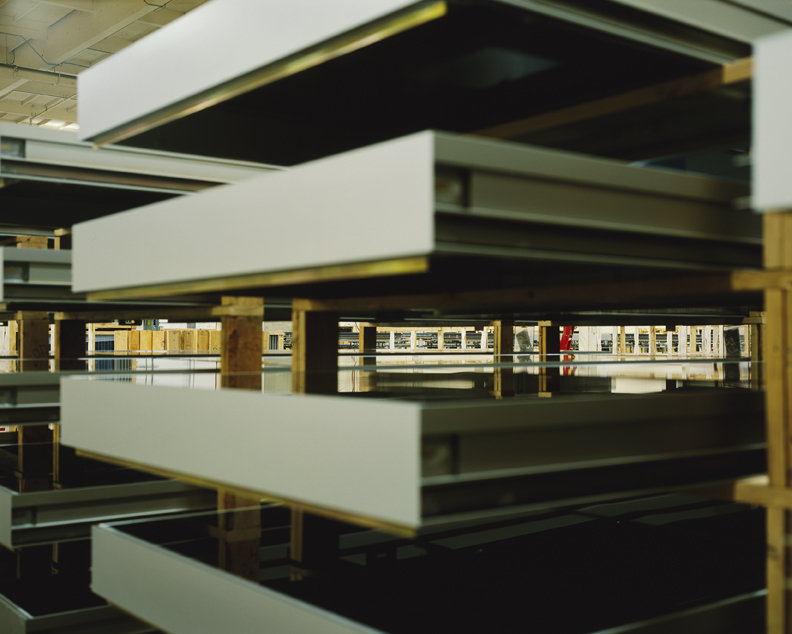 At Benson’s facilities, I witnessed the glass panes in a similarly amorphous state: a skyscraper in its entirety, stacked in piles, and ready to be assembled. To me, these phenomena of stacking and reductive imagery very much resembled the minimalist art movement of the ’60s and ’70s. In the installation, my intention was to make the glass perform within the space, to let go of control of the material, and to let it embody it’s natural tension. This installation was engineered in order to allow the uncertainty of this material to dictate the visual and interactive outcome for the duration of the exhibition.